If Candace Bushnell had settled in Park Slope or Ann Arbor instead of Manhattan, Stapleton might have got herself a plagiarism suit. But as things turned out, this debut collection about young women trying to strike off on their own won its author the 1998 Columbia Journal fiction prize instead. Workshop prose can have a stultifying effect on the writer as well as the reader, and all the pieces here display that obsessive attention to voice at the expense of plot that one can only pick up in a classroom. To begin with, nearly every piece is a portrait rather than a story. The title one, for example, describes in pointlessly ominous detail a girl’s decision to defy her family and go out on a date with a neighborhood tough. The resolution (the girl becomes pregnant and dies) is only hinted at, and in a way that adds more confusion than depth overall. Similarly, “The Middle of October” tells of an unpleasant first date—one that goes sour when the boy’s mentally disturbed twin sister wanders in. The waitress of “The Great Artist,” who has recently settled in New York, dates a succession of bad men, while the child-care worker of “No Such Absolute” finds herself equally unable to connect (“Ana felt everyone was right when they said there are two kinds of men in the world”). The longest piece is “Pure Impending Glory,” which describes the slow coming of age of a woman from a poor family who goes to good schools, studies hard, and eventually becomes a college professor. Journeyman work of considerable talent but no originality whatsoever. 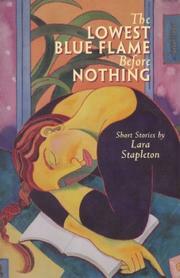 If Stapleton can find a way of matching her imagination to her prose, she—ll have a good future ahead of her. But there’s no sign of that here.